For this years Fathers day I decided treat my Dad to a meal out at The Pig which is nearby in the New Forest. We’ve heard so many good reviews about this hotel/restaurant and after seeing it on the television we put it on our wishlist of places to visit. Now the best thing about this restaurant is that they have their own kitchen garden where they grow their own produce to cook, the food that they can’t grow is locally sourced. 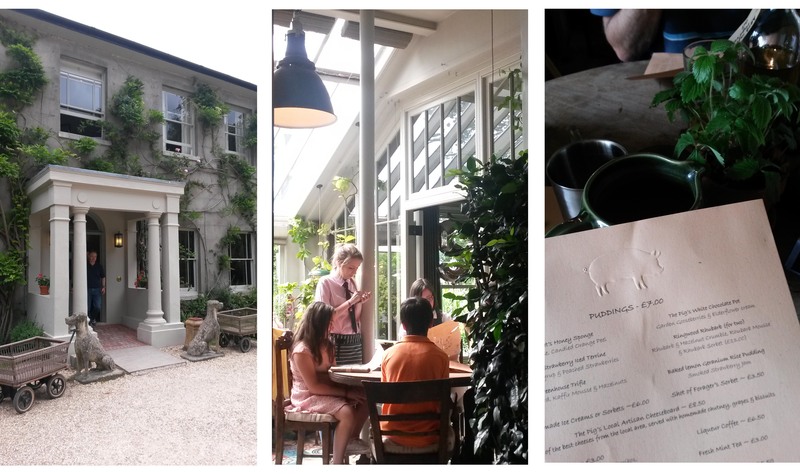 I booked the table for 12.30pm back in March as they get fully booked rather quickly, so we headed down to Brockenhurst with grumbling hungry bellies. We went inside and as we were taken to our table I was blown away by the beauty (I actually gasped! ), to sum it up I would call it a shabby chic, vintage garden potting shed. There is the largest pine dresser against one wall with crates, herbs and terracotta pots. Vintage enamel lamps and large paintings of walled gardens and allotments. Odd chairs, odd tables and odd cutlery which go perfectly together, with little strawberry plants as centre pieces on each table. Vintage tiles on the floor, hessian seat pads and plants growing up the pillars. I really cannot explain how lovely the decor is! Now when it comes to the menu I was a little worried that my fussy tummy wouldn’t like anything they had to offer, how wrong was I! There was so much to choose from but I settled with a wild nettle and hock ham soup with some triple cooked rustic chips as a side (which came served in a terracotta pot!) The soup was surprisingly delicious and I’ve made a note to make some nettle soup at home. 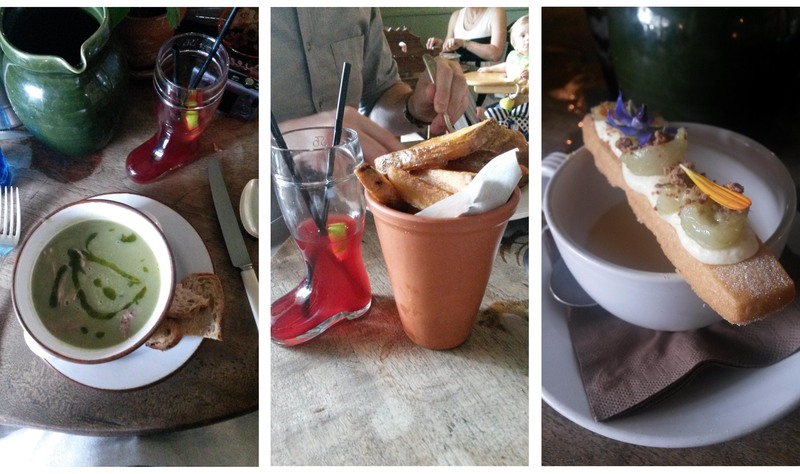 I also just have to mention how adorable the chips served in a terracotta pot was, but that was nothing compaired to my cranberry juice which was inside a welly boot shaped glass! Now for pudding there was only one thing I wanted and that was the hot white chocolate pot, which was served inside a cup and saucer with a shortbread biscuit balancing ontop with homegrown gooseberries, elderflower cream and edible flowers! 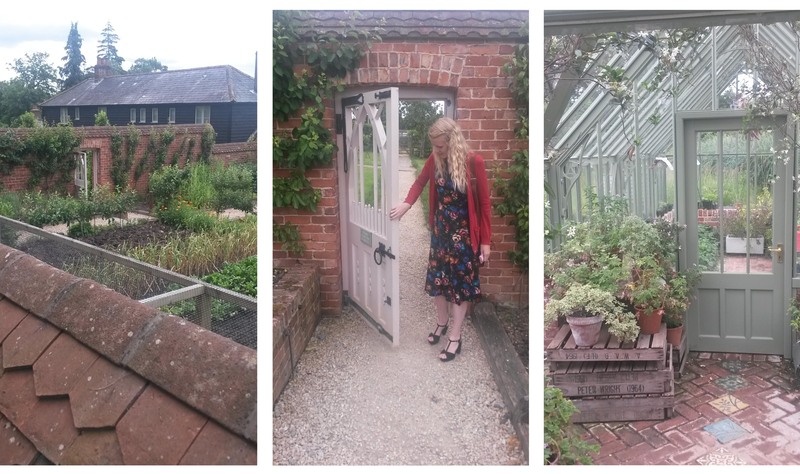 After our meal we decided to go for a little walk around the hotel’s grounds and have a nosey at their walled kitchen garden. It was the perfect size, not too big and not too small, there was even the most beautiful green house I had ever seen. I wanted to move in and live there! After exiting the kitchen garden and greenhouse the path lead you passed a large lake and the potting shed where they offer massages and beauty treatments, we made a note to return here simply because it looked so peaceful sitting in the middle of the lake. The path then turned into a wild flower meadow with a freshly mown path winding through it, it lead passed the walled garden and you could see right over the wall, the most perfect view. I cannot recommend this place enough, I loved it so much I can’t wait to go back again! The decor, the location, the food and the kitchen garden, everything was perfect. 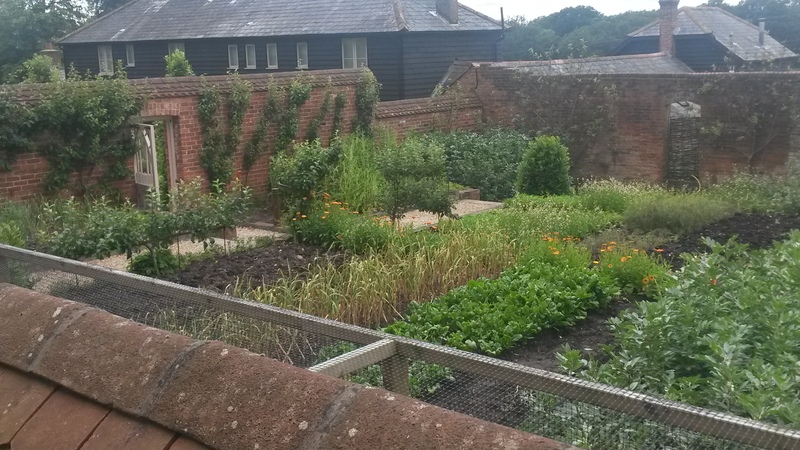 And if you don’t want to go there to eat then it’s worth popping in just to have a look around the kitchen garden. You won’t want to leave! This place looks lovely – I am always so pleased to hear of new places to try. Your dad was very lucky! Some friends took my wife and me there early this year. My friend knew I would love it for all the things you have mentioned. Being late winter we didn’t get outside so missed the garden, not being dressed for winter perambulation, but then I guess you missed aperatifs in front of the roaring log fire. One feature outside I did like was the log wall around the car park. It’s so lovely isn’t it? I’m tempted to go again just to have tea on the lawn and another walk around the grounds. Everything about it was perfect, and yes the log wall was amazing!